Three brothers go on walkabout in the Australian wilderness one evening. While on their spiritual journey, all three brothers are killed by a witch. The spirits of the brothers slay the witch with a boomerang. 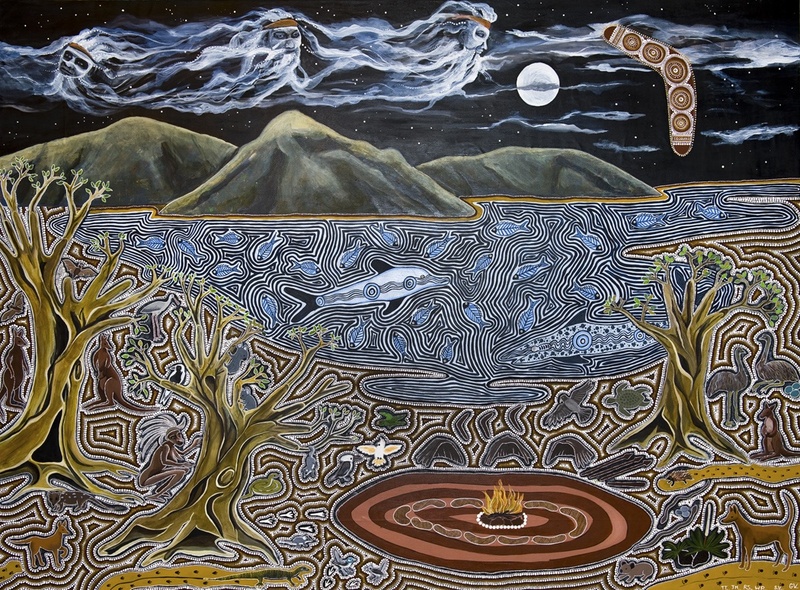 The witch transforms into a billabong, and the brothers turn into the three mountains, called the Birroguns, that watch over the Biripi Nation. 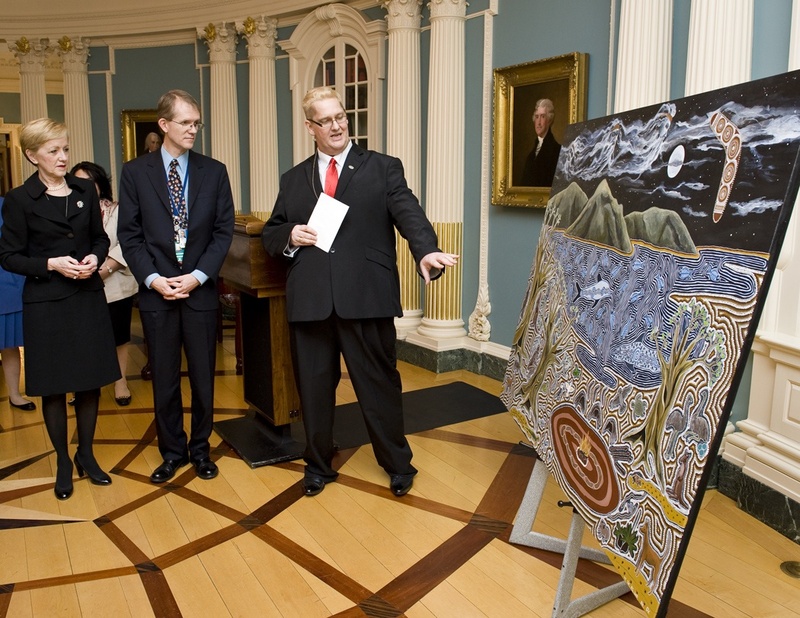 Last week I had the pleasure of heading over to the State Department for a very special ceremony, the acceptance of a breathtakingly beautiful piece of art created by artists from the Biripi and Worimi Nations of Australia. 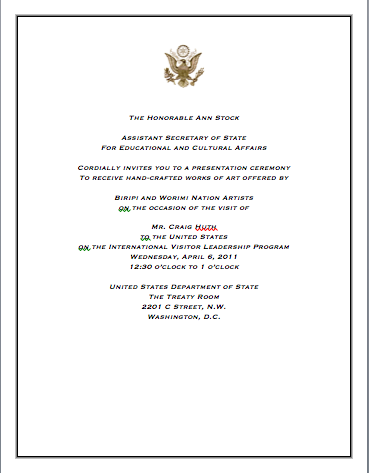 The piece was gifted to the United States on April 6, 2011. The piece was presented by Talk Radio Host Craig Huth, who is visiting the US through the State Department’s International Visitor Leadership Program, which “brings over 5,000 world leaders each year to meet with their professional counterparts.” In his case, Mr Huth will be visiting cities throughout the US to focus on investigative and political journalism and talk radio. This program has been organized by Meridian International Center. And now that we’ve got a background on the program let’s get back to how I finagled an invite to this very special event. Oh the power of the internet, the other day I was going about my day in much the same way that I usually do, checking up on the old blog to see if anything new and exciting had surfaced. A new comment posted by a member of the State Department peaked my interest. 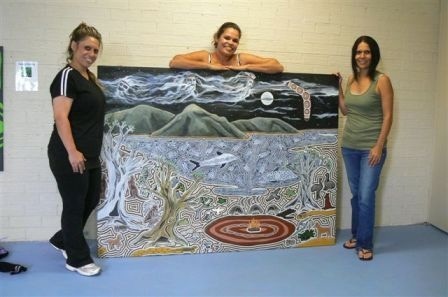 It stated that I was being invited to an acceptance ceremony of Aboriginal Art. “That’s a little odd,” I thought to myself, but I’ll go with it. So I emailed the contact and was sent a formal invitation. I know, sometimes I don’t believe my life either. I was curious how the State Department had stumbled upon my blog so I made sure that was one of the first questions on my list when I arrived. Turns out the US embassy in Australia was aware of the blog and had recommended that I be invited, so a big THANK YOU! to the folks at the embassy. I arrived at the U.S. Department of State building 45 minutes before the acceptance was scheduled to happen. I was greeted by Program Officer for the Office of International Visitors Eboni York and her superior Terry Blatt along with Rachel Wallis from Meridian. Craigh Huth joined us as we made our way to the Treaty Room which was beautiful as well. The furniture was all dark polished woods while the walls were painted in light colors and accented with white faux columns throughout. Think a miniature version of Marie Antoinette’s Villa and you’ll get an idea of what it looked like. Guests were not set to arrive for another 20 or 30 minutes so I had the chance of getting up close to the piece without feeling pressure to move on quickly. In all honesty I could have spent 3 hours with the painting and probably not have seen all of its elements. 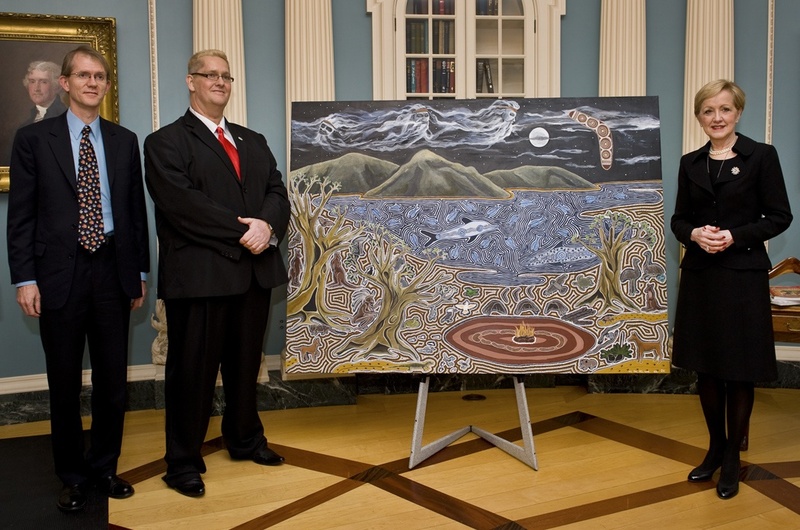 The painting represents the Biripi and Worimi dreamstory of the Three Brothers which is briefly described above. The painting itself tells the story from the bottom up. Beginning with the 3 tents placed around the campfire at the middle bottom of the piece. Each tent represents one of the Three Brothers. At the beginning of the story the billabong and the 3 mountains do not exist, instead the Australian bush stretches across the vastness. The Three Brothers go on Walkabout but as they journey they come upon an evil witch who kills them, but their spirits return and defeat the witch by throwing a boomerang (the traditional weapon of the Aboriginal peoples) and she is transformed into the billabong that you see in the mid section of the painting. The Three Spirits become the three Mountains who now watch over the Biripi and Worimi Nations. The painting is a true testament to craftsmanship, created by 5 artists over the course of 2 months working 10 hours a day. The majority of the painting is done in the traditional dot (desert) style. the spirits and mountains remain in a more impressionistic style as do the trees, melding the traditional with the contemporary. The detailing on the piece is just amazing. When you get up close to it, which I had the privilege to do you can see each an every raised dot. 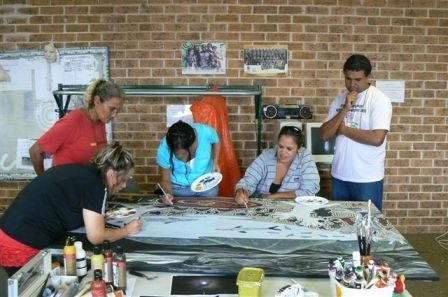 Throughout the painting are traditional Australian wildlife including the kookaburra and the koala bear throughout the piece. One of my favorite aspects of the piece can be found in the 3 trees depicted, hidden within these trees are 5 hands representing the 5 artists that worked on this piece. 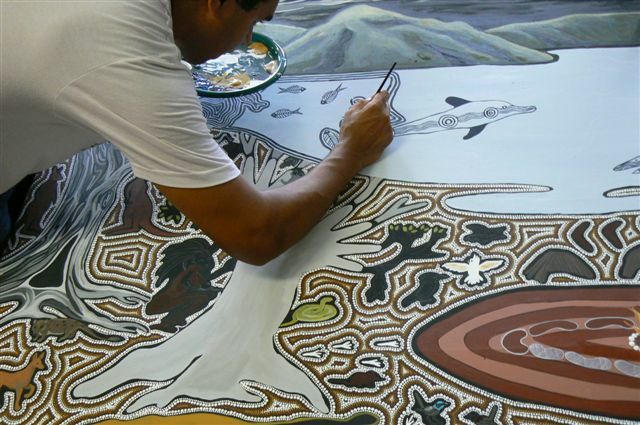 The inclusion of their handprints signifies their strength in the dreamtime story. Do you see the hands? 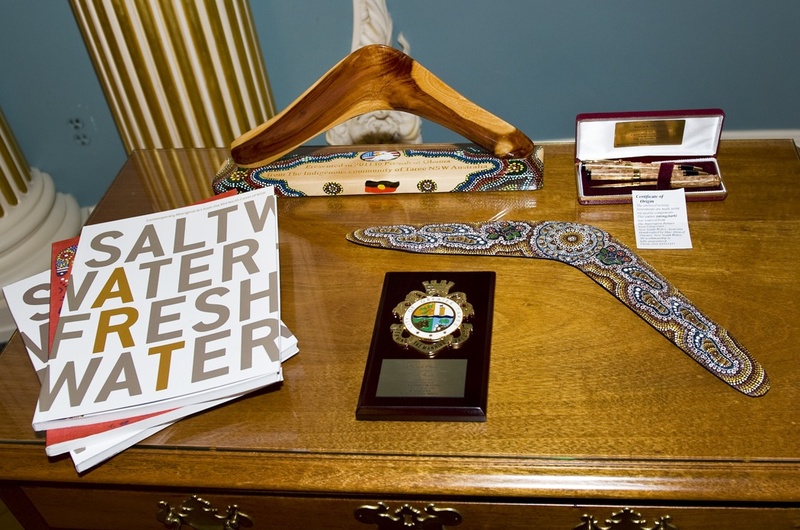 Along with this piece were presented two hand crafted boomerangs meant for the First Daughters. Carved from 1,000 year old pine (traditional materials), these two pieces are meant as gifts to the First Daughters. One of the boomerangs is mounted on a block of wood that has been hand decorated with both US and Australian symbols ( dot patterning along with an Bald Eagle at the center) while the other piece has been hand painted as well in its entirety. We were told it took artist Gina Varagnola 2 months to complete. It was an honor to be included in the event. It was one of those moments when I remember why I am in this business to begin with, to be able to experience art in so many different contexts and to understand its beauty and significance on a intimate level is something that I hope I never grow tired of. Thank you for that beautiful reflection on the wonderful Australian collective painting. I’m the State Department’s public diplomacy officer for Southeast Asia and the Pacific and helped facilitate the gift. I live an 8 minute walk from AU and am often at the Katzen Museum. Pls email me so we can find time for a coffee. That is pretty awesome Brie 🙂 Maybe this is just the beginning of your future in D.C. Enjoyed your story about the State Department event. I was hoping to use your version of the story with a Year 8 class with your permission . Also I would like to use the image. Are you able to tell me whose permission to ask ?